Westfield School Sixth Form Prefects 1967-68. See names below. Photo courtesy of Roy Middleton. on his right is Les Davies (head of P.E. on his right is ? 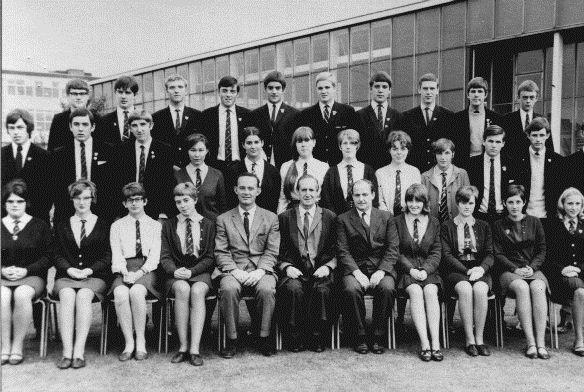 Westfield School Sixth Form Prefects 1967/68. Back row from left: 3. Wyndham Arblaster, 5. Peter Darker, 6. David Mantle, 8. Michael Reid, 9. Tim Stevens. Middle row from left: 5. Jackie Stevens, 11. Roy Middleton. Front row from left: 9. Janet Hartley, 10. Susan Milner.